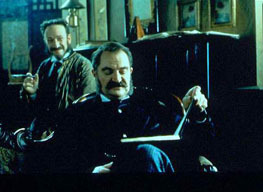 Viewed by many as Mike Leigh’s most conventional film, Topsy-Turvy (1999) in fact uses the conventions of the biographical narrative film to expose the ruthlessness and insularity of the Victorian era, at the same time as it chronicles, with great fidelity, the difficulties of a working relationship in the creative arts. Since many of Leigh’s earlier films, such as Secrets & Lies (1996), Naked (1993), Life Is Sweet (1990), High Hopes (1988), The Short and Curlies (1987), Grown-Ups (1980), Abigail’s Party (1977) and Bleak Moments (1971), are superficially far more experimental in their construction than Topsy-Turvy would seem to be, it is easy to mistake Topsy-Turvy as a departure from Leigh’s other work, and a potential sell-out to traditional cinematic structure. But I would argue that in Topsy-Turvy Leigh is using the same unsparing gaze that he employs in his earlier works to reveal the structures behind the surfaces of the world of Gilbert and Sullivan, thus making them immediate and accessible to contemporary audiences, along with the era they inhabited. Topsy-Turvy is, in short, a radical work masquerading as a conventional biopic, and shows Leigh striking out into new territory as a filmmaker and social commentator. 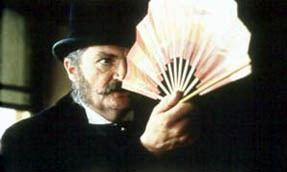 The plot of the film is simplicity itself: Sir Arthur Sullivan (Allan Corduner) and William Schwenck “Willie” Gilbert (Jim Broadbent) have come to a creative impasse. After a string of light comedy musical hits, including The H.M.S. Pinafore and The Pirates of Penzance, Sullivan, who wants to compose “serious music,” has grown tired of Gilbert’s increasingly contrived scenarios, as evidenced by the failure of their latest collaboration, Princess Ida. As the fate of the D’Oyly Carte Opera Company rests in their hands, Richard D’Oyly Carte (Ron Cook) and the company’s manager, the level-headed Helen Lenoir (Wendy Nottingham), attempt to reason with Gilbert and Sullivan, but to no avail. It is only when Gilbert’s endlessly patient wife, Kitty (Lesley Manville), drags Gilbert to a touring exhibit of Japanese culture in Kensington that the librettist rouses himself from his creative torpor. Surrounded by a world of eroticised costumes, samurai swords, Kabuki theatre and tea-drinking ceremonies, Gilbert is transfixed by the spectacle. 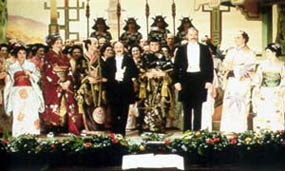 Returning home with a large samurai sword as a souvenir of his outing, Gilbert furiously paces his study floor until he suddenly gets the inspiration for The Mikado, which would become arguably the team’s signature production. Unlike Leigh’s other films, Topsy-Turvy is not only a work of social commentary, but also a site of new historicism, an attempt to excavate the past before it evaporates from our collective consciousness. At a running time of 160 minutes, Leigh has afforded himself a generous canvas for this project, and yet the completed film, correct down to last button and corset, cost only £10 million, most of it raised through pre-sales to a variety of distributors, not least USA Films in the United States. Indeed, Leigh’s films don’t even have titles until long after the actual shooting is complete, and “scripts” are transcribed from the film’s dialogue track as an after-the-fact aide de memoire for public consumption only. (4) Thus Leigh’s films are, in the best sense of the term, a truly collaborative effort, in which the finished film is the result of an enormous amount of detailed analysis and research by the director, the actors, the set designer, costumers and the entire rest of the company. 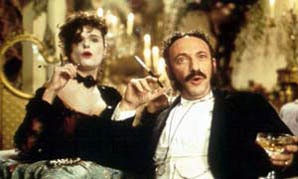 In Topsy-Turvy, when Allan Corduner as Sir Arthur Sullivan plays the piano, he is actually performing; similarly, when he conducts the orchestra within the film, he is actually leading a group of trained musicians. Topsy-Turvy came out at the same time that John Madden’s Shakespeare in Love (1998) was still very much in the public consciousness, and contemporary reviewers at the time often compared the two films, a dubious enterprise at best. This “serious” approach to the material extended not only to the extended rehearsal and dialogue workshop sessions, but also to the costuming, which had to be correct down to the last detail, to achieve a true sense of the physicality of the period. Through this unswerving fidelity to the Victorian era, Leigh makes Topsy-Turvy a direct and immediate film, which partakes not only of the late 1880s in Britain, but also connects the past to such present-day conundrums as the pervasiveness of alcoholism, drug abuse, prostitution, and the seamier underside of social commerce – indeed these are problems that are always with us, but which are usually swept under the rug in most period “re-creations”. One of the company’s performers is an alcoholic; another featured star is a drug addict. Yet another is convinced of his indispensability to the company and demands a steep rise in salary. As Jim Hoberman notes, “the movie’s surface ripples with emotional undercurrents.” The irascible Gilbert struggles with his actors to bring his script to life, importing three Japanese women from the exhibition in Kensington to instruct the female performers on how to move about the stage, and pushing the male leads through a contentious, yet ultimately successful dialogue rehearsal. Richard D’Oyly Carte struggles to keep his two authors and the cast in line, while Sullivan is continually plagued by attacks of excruciating pain due to kidney stones, even as he leads the orchestra through his lilting score. It is clear in Topsy-Turvy that Leigh is fascinated not only with the mechanics of theatrical presentation, but also with the complexities of the human heart. Gilbert’s wife, Kitty, desperately wants children, but Gilbert artfully evades her entreaties, even after the success of The Mikado, leaving her alone to sleep in a room by herself, bereft of her husband’s affection. Gilbert’s home life is further complicated by his utterly balmy father, played by Charles Simon, who appears without warning on Gilbert’s doorstep, craving admittance, but refusing to ring the bell for fear of electrocution. Sullivan, ever the bon vivant, finds escape in elaborately contrived meals, copious quantities of wine and the attentions of his mistress, Fanny Ronalds (Eleanor David), as well as cavorting with Parisian prostitutes. None of this, however, serves to distract Sullivan from the feeling that he is wasting his life on the “piffle” that he concocts with Gilbert, even if these confections do allow him to live his life in relatively luxury. 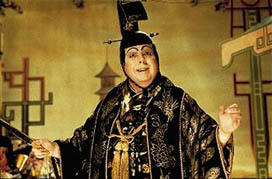 Richard Temple (Timothy Spall), an ageing soloist who plays the part of the Mikado, is mortified when his signature song is cut; only the combined remonstrations of the cast are sufficient to prevail upon Gilbert to restore it. There is a hothouse atmosphere of mutual need, sexual tension, vanity, exploitation, fear and comradeship that drives the company forward, and Leigh teases out the fabric of these interwoven lives until they become the central subject matter of the film, while the actual performance sequences (from Princess Ida, The Sorcerer and The Mikado), the supposed culmination of all this communal effort, seem paradoxically polished to a high sheen, and yet less interesting than the backstage drama we have witnessed. As Leigh summarized his work in Topsy-Turvy, “it’s really interesting to study people taking such trivial work so profoundly seriously” (5). In his cinematic interpretation of the operetta sequences, Leigh adopts an eccentric approach. While much of the on-stage action is staged in strict proscenium fashion, Leigh occasionally cuts to tight close-ups of the actors’ faces during public performance, either to accentuate the inherent artificiality of stage “projection” (as in the “Daughter-in-Law Elect” number), or to convey the inner turmoil of some of the actors as they struggle to maintain their stage presence through a haze of drugs or alcohol. During the excerpts from The Sorcerer, Leigh seems more intrigued with the timing of off-stage sound and visual effects cues than the action on stage. Following Gilbert’s prompt book for The Mikado, Leigh faithfully recreated the original staging, adding his own cinematic flourishes to the proceedings, but, despite being a “closet Gilbert and Sullivan freak” (6), Leigh seems destined never to stay too far from his working-class roots. Perhaps because of this, although the subject matter of Topsy-Turvy would seem to be inherently commercial, Leigh’s approach to the material was resolutely personal, so that the film, despite lavish critical promise, enjoyed only moderate commercial success. Nominated for a number of Academy Awards, the film won only two: Best Costume Design and Best Make-Up, and wound up playing in “selected theatres” rather than a nationwide release pattern, both in the UK and the US. Curiously, although Topsy-Turvy was nominated for Best Picture, Leigh was not nominated for Best Director, a peculiar oversight. I am totally frustrated by that. That’s never the intention. The idea that a film like this, or any film I have ever made, should be dumped in what are regarded as art house cinemas isn’t on. I am not concerned with making esoteric, obscure kinds of films. These are films that can share and talk to anybody about real things. Sadly, the film is already out of print on DVD in the United States, mute testimony to its failure to capture the attention of the American spectacle-driven public – indeed, I found my copy of the film ignominiously piled in a close-out bin at Wal-Mart. A critical success, a commercial failure: this was how the industry ultimately judged Topsy-Turvy. Thus, it seems unlikely that Leigh will ever be given a blank cheque to make exactly the sort of film he wants if he ventures beyond the £10 million budget mark, no matter how many kudos he receives. And yet Leigh, despite moments of wishing for mainstream success, remains resolutely his own man. In an interview accompanying the release of his latest film, the highly acclaimed Vera Drake (2004), Leigh noted that, despite the financial pitfalls of his production method, he only knew how to make films one way: his own. In the final analysis, Topsy-Turvy is a deeply modern film, at once part of the body of Leigh’s work, even as its chronological distance superficially suggests that it will be a conventional film biography. Rather, Topsy-Turvy is an investigation into the social, political, sexual and theatrical economies of the Victorian era, meticulously researched and presented, as Leigh hoped, as if it were a documentary. Leigh’s inherent socialism is everywhere apparent in the film, yet he seems equally sympathetic to all of his characters, whether at the top of the pecking order, or merely members of the chorus. And yet the last word is ultimately Leigh’s, as he re-imagines the emotional landscape of Victorian England in a manner that is accessible and direct for contemporary audiences. So, in a sense, Mike Leigh has begun to mine his own past, as well as the past of British culture as a whole. But whether viewing Victorian London in the 1880s, the same metropolis in the bleak post-war 1950s, or an equally drab London in the first years of the 21st century, Mike Leigh’s vision is both unique and original, and a testament to the worth and life of the individual artist in an otherwise industrialised regime. His approach to his work, and his execution of it, means that Leigh will forever be an outsider to the mainstream cinema, looking in, which is paradoxically the best position for Leigh to be in. In real life, as in his films, Leigh requires some distance to effectively chronicle the society that he is, somewhat reluctantly, a part of. Only someone looking in from the outside could so effectively document the many ruptures and breaks that form the fabric of British society, past and present, which ultimately, and transcendentally, informs the work of Mike Leigh. Michael Coveney, “In A Class of His Own”, in Howie Movshovitz (Ed. ), Mike Leigh Interviews (Jackson: University Press of Mississippi, 2000), pp. 35-41. Roger Ebert, “Topsy-Turvy”, The Chicago Sun-Times, 21 January 2000, 15 December 2004. Ryan Gilbey, “From Abigail to Arias”, The Express, 19 February 2000, p. 43. Jim Hoberman, “Your Show of Shows”, The Village Voice, 12-15 December 1999, 22 December 2004. Edward Trostle Jones, All or Nothing: the Cinema of Mike Leigh (New York: Peter Lang, 2004). Tom King, “Hollywood Journal: How Barry Diller Sees the Movies”, The Wall Street Journal, 6 February 2001, W4. Derek Malcolm, “Mike Leigh at the NFT”, The Guardian, 7 October 2002, 15 December 2004. Janet Maslin, “Topsy-Turvy: Gilbert and Sullivan Get Back to the Drawing Board”, The New York Times, 17 December 1999, 22 December 2004. The Numbers, The Box Office Data Website, 18 May 2005. Sean O’Hagan, “I’m Allowed to Do What I Want – That Amazes Me”, The Observer, 5 December 2004, 15 December 2004. Michael Sragow, “The Roar of the Greasepaint, the Smell of the Crowd”, Salon.com, 23 December 1999, 15 December 2004. David Sterritt, “Topsy-Turvy is True to a Legendary Team”, The Christian Science Monitor, 17 December 1999, 20 December 2004. Amy Taubin, “Mike Leigh Improvises on History”, The Village Voice, 15-21 December 1999, 20 December 2004. Kenneth Turan, “The Case For Mike Leigh”, Movshovitz (Ed. ), pp. 84-97. Gregory Weinkauf, “England’s Dreaming: Director Mike Leigh Owns Up to His Romantic Side and Sorts Out All Things Topsy-Turvy”, The Dallas Observer, 27 January 2000, 22 December 2004. Larry Worth, “Lies Director Shows True Colors”, Movshovitz (Ed. ), pp. 122-3. Michael Sragow, “The Roar of the Greasepaint, the Smell of the Crowd”, Salon.com, 23 December 1999. Amy Taubin, “Mike Leigh Improvises on History”, The Village Voice, 15-21 December 1999, p. 85. Michael Coveney, “In A Class of His Own”, in Howie Movshovitz (Ed. ), Mike Leigh Interviews (Jackson: University Press of Mississippi, 2000), p. 49. Gregory Weinkauf, “England’s Dreaming: Director Mike Leigh Owns Up to His Romantic Side and Sorts Out All Things Topsy-Turvy”, The Dallas Observer, 27 January 2000. Sean O’Hagan, “I’m Allowed to Do What I Want – That Amazes Me”, The Observer, 5 December 2004.